In the last lesson, Lesson 49, we analysed the first hymn from the Rig Veda. In this lesson, the last one in the current series of lessons, we will briefly review what we have discussed so far. Sanskrit is the oldest language in the world whose literary outputs are still available. The oldest Veda, the Rg Veda, is at least 4000 years old, based even on the most conservative estimates of the western and other scholars. Bal Gangadhar Tilak has convincingly dated it to a period not later than 4000 BCE, when the vernal equinox was in Orion. He quotes many Vedic texts and legends to support this conclusion. [See B.G. Tilak, The Orion Or Researches into the Antiquity of the Vedas]. If these collection of verses – The Rg Veda -, a lot of which have quite high literary value, date to at least 6000 years ago, surely the language they are written in should have been a widely spoken and complete language at least 7000 years ago. Even if we take the conservative estimates of the western scholars, Sanskrit as a language should have been highly developed at least 5000 years ago. Most of the languages spoken in northern India trace their ancestry to Sanskrit. And the languages of South India have borrowed heavily from Sanskrit, so much so, a majority of the words used in, say, Malayalam are of Sanskrit origin. So the debt that Indian languages owe to Sanskrit is immense. The coming of the Sanskritic culture to South India and to areas of South East Asia was a defining moment for these areas. Also, there are very clear similarities between Sanskrit, Greek, Latin and other languages of Europe. The Indo-European language group is a closely connected group of languages that include the languages of North India, of the Iran area and of Europe and Sanskrit is the oldest extant member of this group. Sanskrit has a tradition of being the vehicle for reporting on a great many areas of research and literature. Some of the outputs of these researches and literature are: the Vedas, the Brahmanas, the Aranyakas, the Upanishads, epics like the Ramayana and the Mahabharata, puranas like the Bhagavata, the Vishnu Purana and many others, Buddhist writings and literature, literary outputs like poetry, drama and prose writings, works on medicine, eroticism, aesthetics, logic, astronomy and astrology, Tantra, ritual, music, sculpture, painting, philosophy, theology, devotion, dictionaries, thesauruses, etymology, mathematics, architecture, law and many other areas. There was an astonishing amount of work done in Sanskrit till about three hundred years ago. So, certainly Sanskrit is not a “dead” language as some people say. It may not be being used for day to day communication now, but the works produced in the language are still very much used, especially in religious interchanges and for literary enjoyment. Sanskrit has a continuous, unbroken tradition from ancient times to now. We will see … that works composed in Sanskrit are at least 4000 years old. 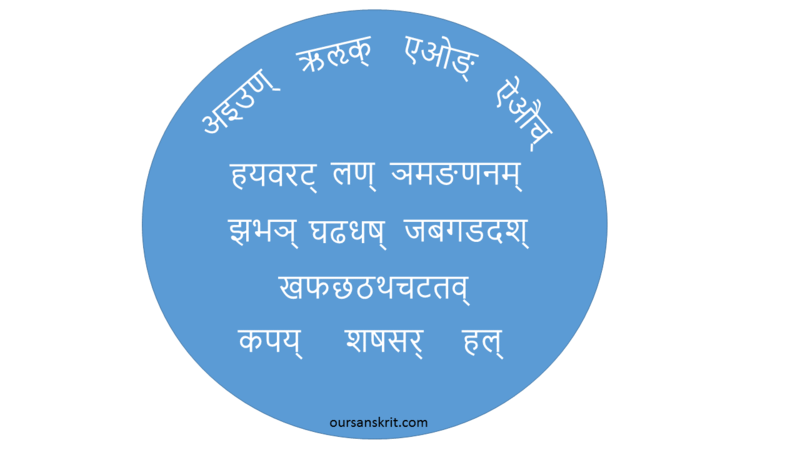 So learning Sanskrit allows us to understand why many of our traditions are what they are. The attempt in these lessons was to bring the depth and breadth of Sanskrit language to people who are interested it it. Of course, the lessons were quite deep and it may not have been easy reading for a beginner. But, I think that with some perseverance, everybody can gain a decent knowledge of Sanskrit from these lessons. We looked at declension, conjugation, Sandhis, the ten root classes, the present tense, active and middle voices, the imperfect, pronouns, relatives, numerals, the imperative and the optative, present and past participles, the passive voice, verbal prefixes and continuatives, infinitives and gerundives, thematic and athematic verbs of the different classes, compound words, future tenses and the conditional, the perfect tense, the causative, the desiderative, the intensive and the denominative, the aorists, the indeclinables, and the derivation of stems. We then looked at the outlines of the syntax of the language. Then we looked at Vedic Sanskrit especially accents, the subjunctive and the infinitives and conjugation systems. In the course of these, we looked at and analysed a few stories from the Hitopadeśa, some verses from the Naḷopākhyānam, and some verses from the Rig Veda. This is the last lesson in this series of lessons. I hope you have enjoyed going through these lessons as much as I enjoyed writing them.